In year 2008 and 2009, when most of the companies in the world were passing through a state of recession and financial crisis, there were some who went on the offensive and scored big. So this week when Barron released its annual list of the best CEOs in the world, Steve Jobs of Apple returned to the list from last year, joining Jeffrey Bezos of Amazon.com, Warren Buffett of Berkshire Hathaway and Mark Hurd of Hewlett-Packard. When Barron drew up its annual list of the 30 most respected CEOs, it sought to identify executives who kept their companies out of trouble and took advantage of the downturn to expand, make shrewd acquisitions, feast on the problems of competitors, and sailed their respective companies smoothly to high laurels. After lots of deliberations and consideration, a new list of the 30 "most respected" Chief Executives across the world has named Apple co-founder Steve Jobs as the most valuable of all, noting that "America could use 1,000 more like him". 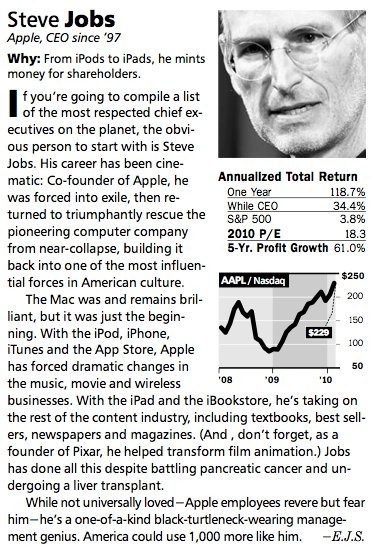 Probably the world’s most valuable CEO is Steve Jobs of Apple, as shown by stock dips on news of his medical problems. Apple recently hit a record, with a market value topping $200 billion, a reflection of the Street’s confidence that a healthy Jobs (at least from what we can tell) continues to keep Apple ahead of the game. Jobs likely accounts for $25 billion or more of Apple’s market value. The Mac was and remains brilliant, but it was just the beginning. With the iPod, iPhone, iTunes and the App Store, Apple has forced dramatic changes in the music, movie and wireless businesses. With the iPad and the iBookstore, he’s taking on the rest of the content industry, including textbooks, bestsellers and newspapers.